The need to improve treatment and care for people with blood cancers like myeloma, and the work of Myeloma UK, has been highlighted in the first report by Westminster’s cross-party group on blood cancer. 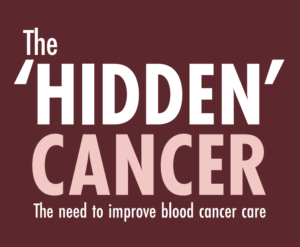 The All Party Parliamentary Group (APPG) on Blood Cancer was formed in 2016 and has now published its first report, The Hidden Cancer: the need to improve blood cancer care, following a wide-ranging inquiry which examined how the needs of blood cancer patients are being met under England’s cancer strategy. The report concludes that more needs to be done to raise awareness of blood cancer and ensure that services are tailored to meet their needs. One key theme in the report is the need to improve diagnosis. This is a particular issue for myeloma patients where one third (34%) of patients are diagnosed through emergency routes rather than through GP referral, often negatively impacting on their quality of life. Myeloma UK submitted evidence to the inquiry, with the work we are doing to improve diagnosis and access to new treatments through our Clinical Trial Network being highlighted in the report. Rosemarie Finley, Chief Executive, Myeloma UK attended the report’s launch at Westminster and the debate which coincided with its publication. Rosemarie said; “This report from the AAPG on Blood Cancer is an important step in bringing about awareness and changes to care for blood cancer patients. “Working with other blood cancer organisations and key politicians is an essential part of what we do at Myeloma UK, to help improve care, access to treatments and instigate positive changes to impact the lives of patients. Working with other blood cancer organisations and key politicians is an essential part of what we do at Myeloma UK, to help improve care, access to treatments and instigate positive changes to impact the lives of patients. We would like to hear your diagnosis and treatment experiences, to help us inform future reports and bring about change. Contact the Patient Advocacy team at policy@myeloma.org.uk or call 0131 557 3332.